The town of Leiston has always had deep roots in the military history of this island. For over three hundred years, men of the town and its locality, have volunteered to serve their country both at home and overseas. Though geographically, the town has had no affiliate military unit since the late 1980s, it's military past is a proud one. ​Please read below, a brief history of the military links with of the town, and of the birth of the Leiston Branch of the Old Comrades Association. Men of 4th Suffolk in France 1915. Being close to the east coast of England, there has always been a military presence in the town of Leiston ever since the threat of a Dutch invasion and the great sea battle at Sole Bay off Southwold in 1672. ​In the nineteenth century, with the formation of many numerous volunteer militia units all across the county, there became a formalisation of all these units in the late Victorian era administered battalions. 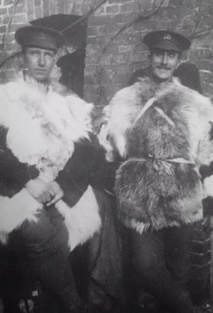 The 9th Suffolk Rifle Volunteers, were formed in Leiston in the 1850s and numbered over seventy men in number, with as their commander, Captain R. Garrett: a member of the famous local engineering family that would have links with the military of the town until the 1950s. Then, they were part of the 3rd Adminstrative Battalion, Suffolk Rifle Volunteers, but by the time of the Franco-Prussian War in 1871, their unit had been redesigned as 'H' Company of the 3rd Battalion, before in 1880, the Battalion was renamed as the 1st Battalion, Suffolk Rifle Volunteers. Just six years later, still as 'H' Company, they became in 1886 the 1st Volunteer Battalion, the Suffolk Regiment, starting a link with the regular infantry regiment of the county. Now, they could receive limited training with modern weapons, and a regulated uniform. As a final result of a long overdue overhaul of the volunteer battalions in England, in 1908, Lord Haldane completed his reforms of the British Army and abolished all the old rifle volunteers and created instead, the Territorial Force (T.F.). As 'H' Company of the 4th (Territorial) Battalion, the Suffolk Regiment, the men of Leiston marched off to War in 1914 and within five months, they were fighting gallantly at the Battle of Neuve Chapelle, where the award of four Distinguished Conduct Medals to men of the town. ​Later on the Somme, the 4th Battalion served with distinction at the Battle of High Wood in August 1916, when great gains were made. Later in 1917, they attacked and held the fortified positions at Fitzclarence Farm near Ypres, and in 1918, they were some of the first troops to cross into Germany as part of the Army of Occupation. ​In the post-war years, the Territorial Force was temporarily suspended, only to be reborn in the early 1920s. ​During the Second World the 4th Battalion suffered greatly at the hands of the Japanese. As part of the ill-fated 18th (East Anglian) Division, they embarked at Singapore to fight a hopeless battle before being taken into captivity. For three and a half years, the men of Leiston bore the brutality and starvation of their captivity with great determination. Many however did not return. Whilst their family members were away, the 8th Battalion of the Suffolk Home Guard was formed in the town in 1940. For those working in a reserved occupation in the town's important and vital engineering works, they could serve in the evenings and weekends and many did. ​In the post-Second World War, the need for territorial infantry was again temporarily suspended, until the need again for a home defence force to repel a Soviet invasion became a serious threat. The Territorial Army in Leiston was always kept a good strength, with numerous young men of the town, who had just completed their National Service, and who had to spend two years in the Reserve, spent time with the Battalion. The 1950s saw record numbers in its ranks and annual camps were a highlight of the T.A. year. Ironically, there was a high proportion of Far Eastern Prisoners of War still serving, and within the Band, at least five men who had served with the Battalion in France in 1915. In 1961, a new Drill Hall was built and the newly formed Suffolk and Cambridgeshire Regiment (T.A.) .moved in with record numbers in its ranks. With a rundown of the T.A. in 1967, the Suffolk and Cambridgeshire Regiment was placed in suspended animation and eventually disbanded. Those who remained to serve, continued as part of the 6th (Volunteer) Battalion, Royal Anglian Regiment. In the late 1980s, the T.A. left Leiston for good and sadly, just a Cadet presence was left in the town. The Suffolk Regiment however lived-on in the newly created Leiston Branch of the Old Comrades Association, and now in the Leiston Branch of the Friends of The Suffolk Regiment. Since it’s amalgamation in 1959, the Suffolk Regiment has always remained a presence in Leiston. From 1964 until 1988, Former C.S.M. Arthur 'Smudger' Smith had ensured that “News From East Suffolk” reached the members of the Old Comrades Association. Smudger did a great amount of work keeping all those former members of the Regiment in contact with one another via the then Regimental Newsletter, the 'Britannia & Castle' but it was only in 1989 that he felt that their should be a Branch of the Old Comrades Association in Leiston, that could hold regular meetings for those who lived in the locality (including Aldeburgh, Saxmundham and Halesworth). At its very first meeting in January 1989, with just thirteen ex-Suffolks in attendance and five apologising for not being able to attend, the Leiston Branch of the Suffolk Regiment Old Comrades Association was formed. The Chairman was Arthur ‘Smudger’ Smith B.E.M., who had served with the 2nd, 4th and 8th Battalions of the Suffolk Regiment, together with the Suffolk and Cambridgeshire Regiment (T.A.) and the Suffolk Army Cadet Force. The Secretary was Ron Thompson, a former Far Eastern Prisoner of War, and the Treasurer was Wilf Goddard, who was also a F.E.P.o.W. In April, they moved from their temporary home at the TA Centre, to their new meeting place at the Leiston Town Athletic Association, for regular monthly meetings. Here too, the new branch President was formally announced. Major Wally Mayhew was a Leiston man whose military career had started with 4th Suffolk at Leiston in 1939. Their first official function was a Buffet-Dance at the TA Centre in Leiston in May 1989 which was an instant success and set the regular pattern for the next 27 years. With the aim of being able to procure a Standard for the Branch, that August branch member John Perrett, opened his home and garden up for the benefit of a fete to raise funds. It was a great success and it was noted that at the end of their first year, they had a surplus in funds which was set aside as a deposit for the Branch Standard. The following year Major Mayhew retired to Bury St. Edmunds and in his place, John Perrett gratefully accepted the invitation to become President. He remained in this position until 2002, when John Richardson took over the role. The Branch Standard was finally produced in 1993 and was Paraded at Minden Day for the first time that year. Apart from a brief period when it was repaired (this was carried out by the Friends in 2013), it is still very much in active service. ​With the passing of time, committees have come and gone, generations have changed, but the Branch still retains its presence in the town. Its biannual buffet-dances continued until 2016 when regretfully, it was decided that they could no longer continue, and in August 2018, the branch agreed to change is name and continue as a branch of the Friends of The Suffolk Regiment.